A septic installation involves planning design, and significant coordination with the town for permits and inspections. 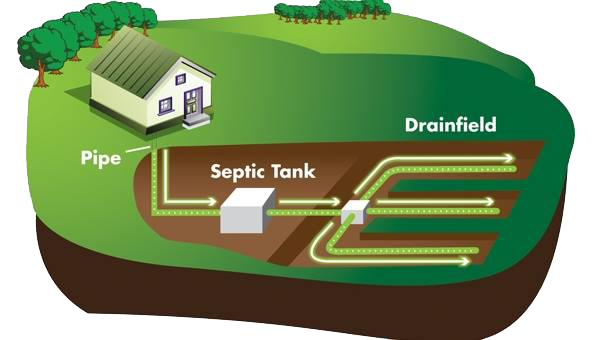 With over 75 years of experience, New Milford Septic is the right choice for your installation. New Milford Septic Services will test the area where the new septic system is to be installed. This is where the septic water will drain. This test will determine the porosity of the soil. The goal is to find the best soil in your yard to install the system in. Soil too tightly compacted will not drain water efficiently, possibly contaminating ground water. You may also need a soil specialist or engineer to analyze a sample of that soil to verify conditions. The local town Sanitarian will then review the soil findings and provide the requirements for your new septic system. Specific requirements such as size of tank, type of system, trench or field size etc. will be provided to us. We will then verify your specific septic needs, review the soil data and then completely design your new septic system. This design process is specific & unique to your particular property. We will then review the design with you. When all parties are satisfied with the design, it will be submitted to the local Health Department for approval. The approval process includes an approval in total or the design may require necessary changes before final approval. After the Septic Design is fully approved, a Permit is issued for the work to be performed. This permit may be granted in a few days or take as long as weeks. The process depends on the complexity of the job and the particular town in which the septic system is proposed to be installed. Once the entire septic installation design is approved and the permit granted, New Milford Septic Services will draw up a contract for your approval. Once that contract is agreed upon, including payment arrangements, all parties sign. We will then schedule your new septic system installation to begin. During the installation process, one or several inspections will be performed by the town Sanitarian to ensure that the new septic system is being installed to the proper design specifications. Once your new system is completely installed, we will document the exact location of all of its parts. This will ensure that the septic system meets town standards.